Comprised of a team of accomplished legal professionals, Codilis and Associates, P.C. represents a wide variety of clients, including mortgage servicers. With 30 years in legal field, Codilis and Associates has undertaken cases involving evictions, REOs, foreclosures, and various other areas of creditor rights. Professionally affiliated with the Federal Home Loan Mortgage Corporation (FHLMC) Designated Counsel for Illinois and the Federal National Mortgage Association (FNMA) Retained Attorney Network for Illinois, Codilis and Associates is extensively involved in the legal aspects of the mortgage banking field community. Codilis and Associates is also a member of the Mortgage Bankers Association of America and the Illinois Mortgage Bankers Association. ​In addition to representing mortgage servicers, Codilis and Associates is dedicated to utilizing its deep knowledge to help those affected by the current economic crisis. In December 2009, Codilis and Associates joined several other firms in supporting the Attorneys’ Title Guaranty Fund, Inc.’s efforts to raise funds to assist and educate at-risk homeowners about the foreclosure process. 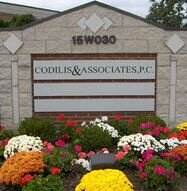 Founded in 1977 by Ernest J. Codilis, Jr., Codilis and Associates is currently based in Burr Ridge, Illinois.